What could be better than a triple layer of corn flavor during autumn corn season? 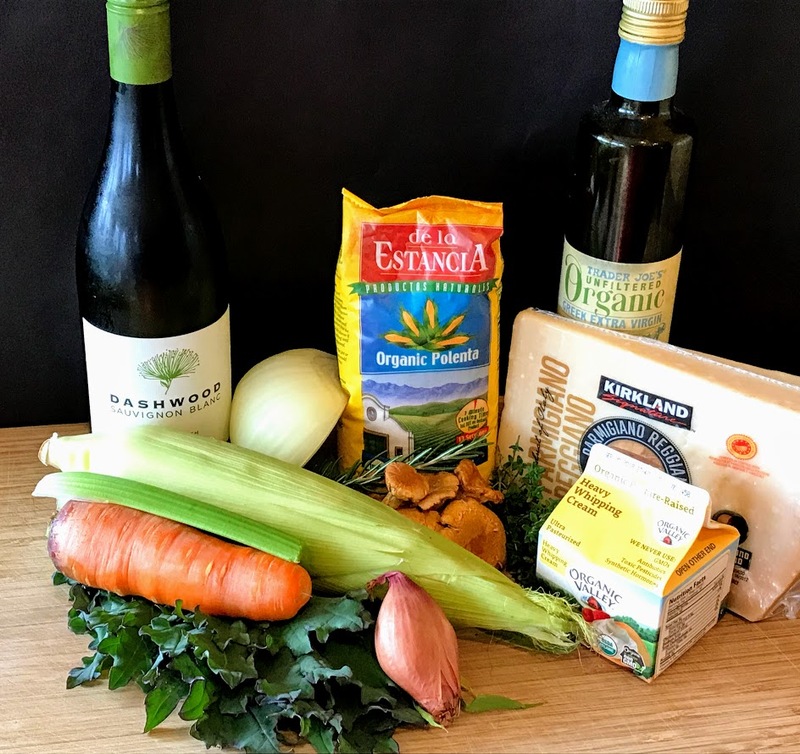 By making this very easy corn broth, using the corn kernels and pulp with polenta is a corn lover’s dream come true. Add some fresh wild mushrooms like chanterelles and greens to have a complete meal in a bowl. 1. Slice off the tassel end of the corn leaving the husk in place. Slice off the stalk end of the corn cobs exposing the last ring of corn kernels. Wrap in two layers of wet paper towels. Place in the microwave and cook for three minutes on high. Remove the husk and silk by pulling from the tassel end. 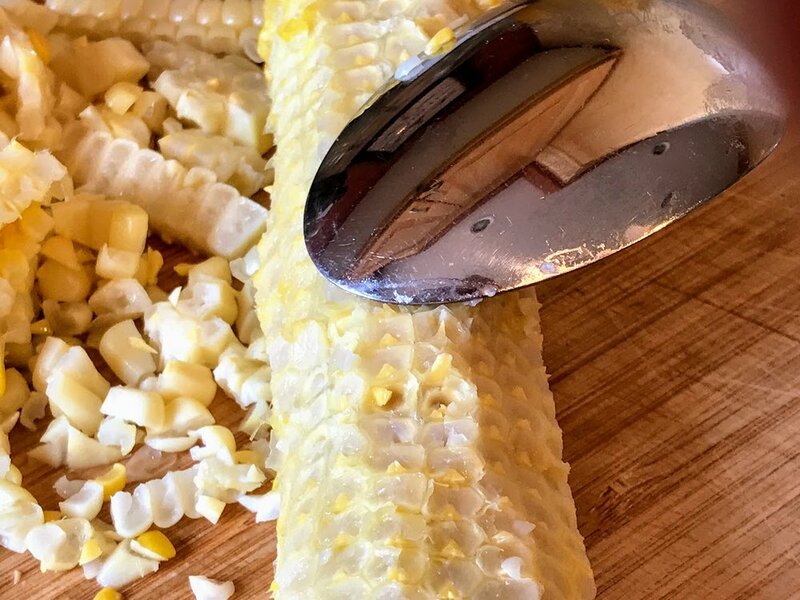 Slice the kernels off the cob and reserve. With a teaspoon scrape the pulp from the cobs and reserve. Cut the cobs into several one-to-two-inch pieces. 2. Heat one tablespoon olive oil in a stock pot until it shimmers. Add the onion and carrots and sauté for about three minutes. Add the celery and sauté for another two minutes until all the vegetables are soft. 3. Deglaze with white wine. Add the water, bay, and thyme. Bring to a boil and reduce to a simmer. 4. Simmer until reduced by half, about an hour or more. Strain through a mesh sieve. 5. To prepare the polenta bring the corn broth, butter, reserved corn pulp, and salt to a boil. Whisk in the polenta. Bring back to a boil, reduce to a simmer and stir for ten to fifteen minutes until slightly thick. Add the cream and cheese. Reserve in a warm place with the lid on. 6. Heat a sauté pan with a tablespoon of the olive oil over high heat. Add the shallots, mushrooms, and rosemary. Toss and sauté until golden brown. Remove from pan and reserve warm. Add half of a tablespoon olive oil to the pan and toss the greens until wilted. Reserved the greens warm. Sauté until heated through. Add half of a tablespoon olive oil to the pan and toss the corn until warm. 7. Distribute the polenta into four soup plate bowls. 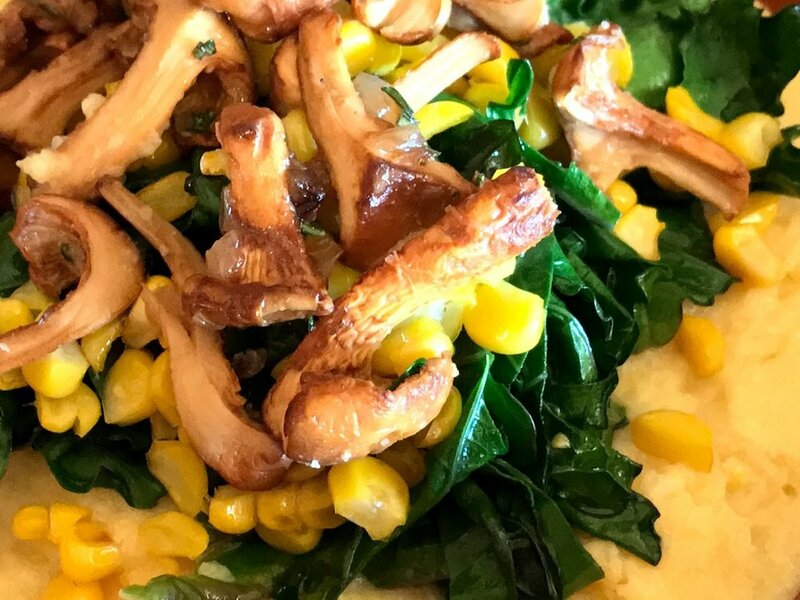 Top with the mushroom, greens, and corn sauté. Serve hot.